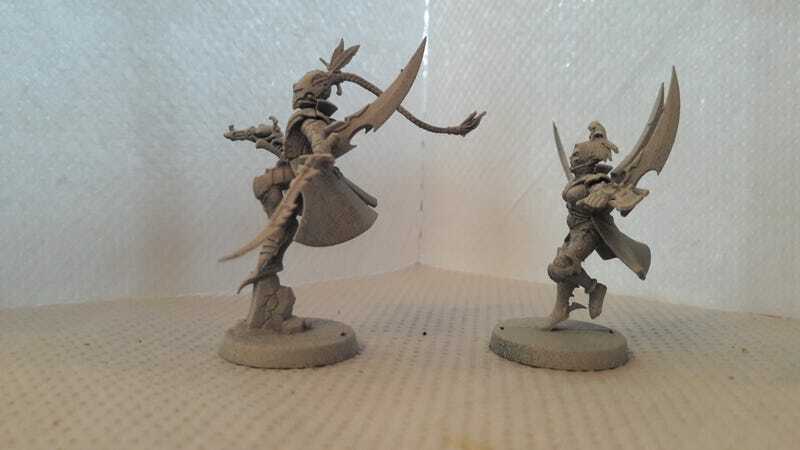 Corsair Conversions or Alternate Models? I have been toying with the idea of using the old scourges backpacks as corsair jetpacks since they are dirt cheap on ebay. I am going to clip them in half and glue them on at an angle. Definitely the way to go. 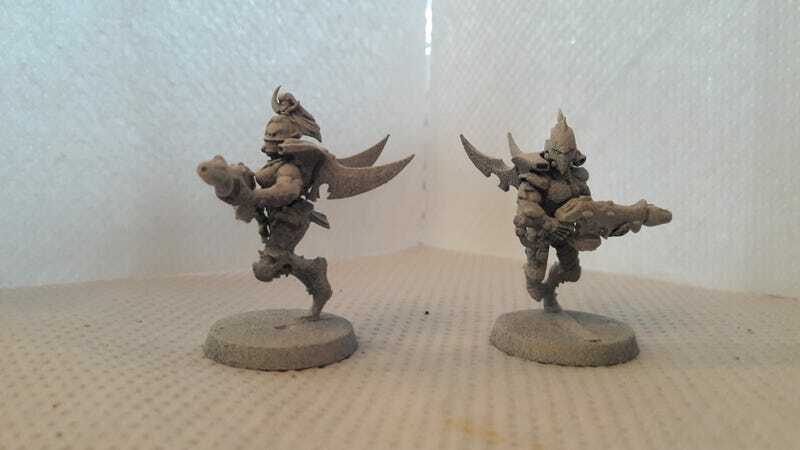 I mentioned bending them as an alternative but here is what I ended up with today after clipping them down the middle and slotting them into the backs of plastic scourges. Don't mind the gaps, especially where the wing meets the shoulder. 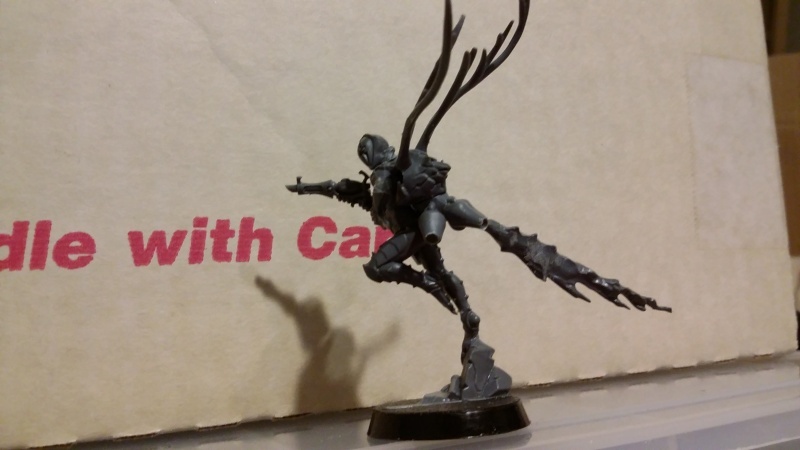 I use epoxy sculpt (cuz it's waaay stronger) to fill on metal conversions and I'm all out. 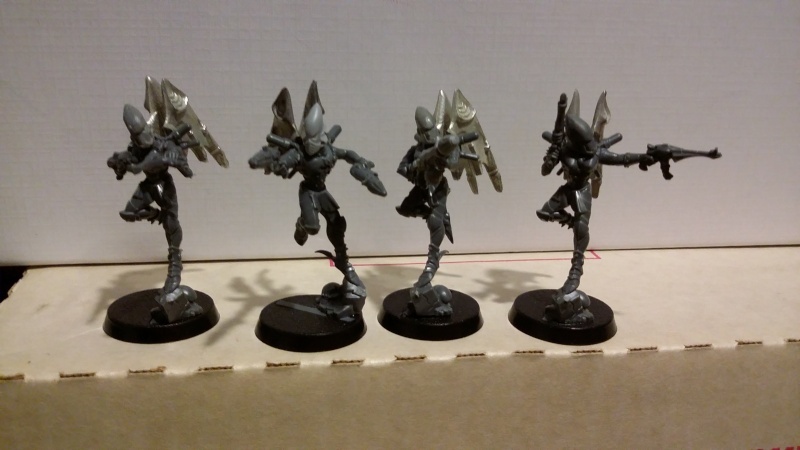 So - new scourge bodies, old scourge wings, guardian heads, wych pistols, and harlequin pistols. Everyone has those laying around right? And don't ask where I got the 20+ year old fusion guns, they've probably been in my closet that long. 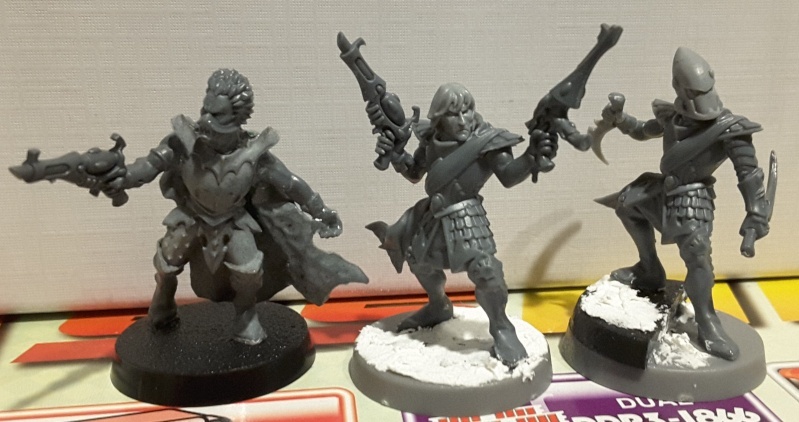 Also I'd never field the felarch with 30 points worth of useless pistols, that's just some blue tack fun. But ya those old scourge packs are most definitely jet packs; air intake - directional jets and all. I was going to drill out the vials on the scourges backs and call them jets too, but then decided they are the fuel tanks. These are of course super top heavy, even with magnets in the bases. Might look in to a lead fishing weight or something to offset them further. I really love the pose of that one on the far right. Very nice. Makes me excited to get started on my own band of corsairs. Pistols Akimbo looks totally badass, as always. Went digging for inspiration on how to convert splinter rifles into lasblasters or sniper rifles and I realized that I already have enough painted metal rangers with either (and surprisingly a few with dual pistols). 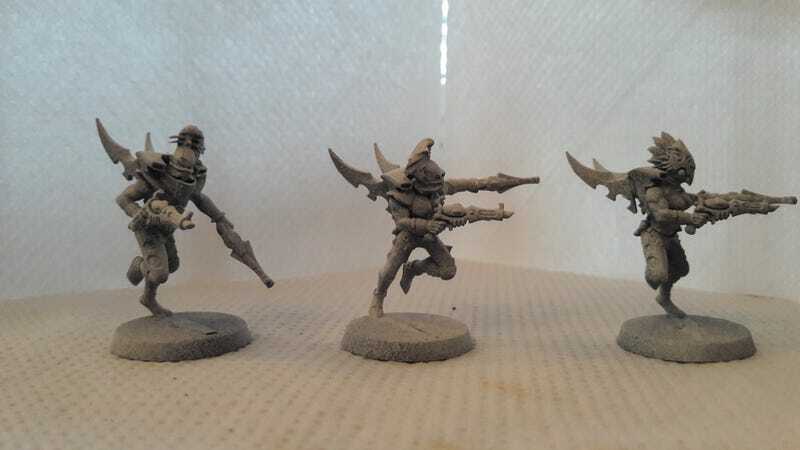 So I decided to go with pistols, partly so they could easily be fielded as either reavers or ghost walkers. My old kabal was exodite themed, and these are my re-purposed warriors. I thought splinter pistols fit well with exodites but it doesn't hurt that I had a few dozen of them. The blasters are my old true born, which might get replaced with melta guns if I can scrounge up enough. Those last 3 are the barons to attach if I'm maxing out coteries. I love those. I think my favourite is the middle chap in the last picture - that's a wonderful pose. He's part of a high elf sky cutter crew, neck drilled out with a bare head from the eldar guardian kit. Shoulders also have to be drilled so the pistol arms from the harlequin and wych kits fit. I liked how arrogant he looked, but he'd have been a baron anyway because he has heavier armor than the rest. It looks like one of my major sources for cheap bits has dried up though so no real hope of mass producing those. 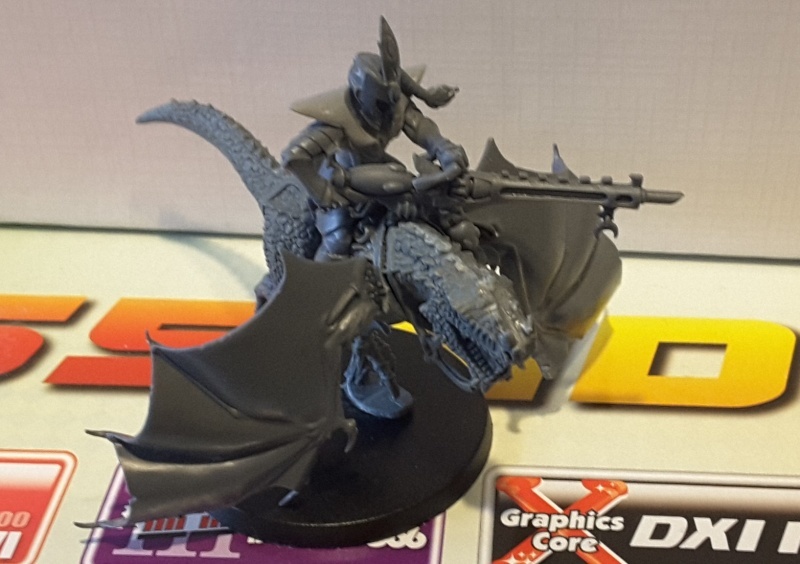 I could make a few more of him if I had harlequin pistols, but as it is I'll probably just swap splinter pistols onto wych knives, or maybe stick some venom blades on them. This is what my "jet-bikes" from those coteries will look like. Very WIP but I finally decided to commit and start lopping limbs off. I plan on green stuffing feathers on his head where I filed down the scales... then after about 10 of these I get to move on to the flyers. Gotta find the phoenix bomber/night wing dimensions somewhere so I can try and get my dragons sized properly. Also, does it come with those wings or did you add them? It's just a fantasy cold one... I forget which version. I cut and drilled his fore arms down and replaced them with the bat wings from the scourge kit. I only used the feathered wings on mine so I have 6-8 pairs of bat wings left over. Will have to get some more to flesh out all 10 splinter bikes. The rider is kit bashed from like 4 different things. I'm not even sure where the legs come from, but they fit the cold one. That actually looks really nice. This is something I've been struggling with myself for quite a while. I've yet to see a skyboard converted to a backpack that I liked. They're just too big. 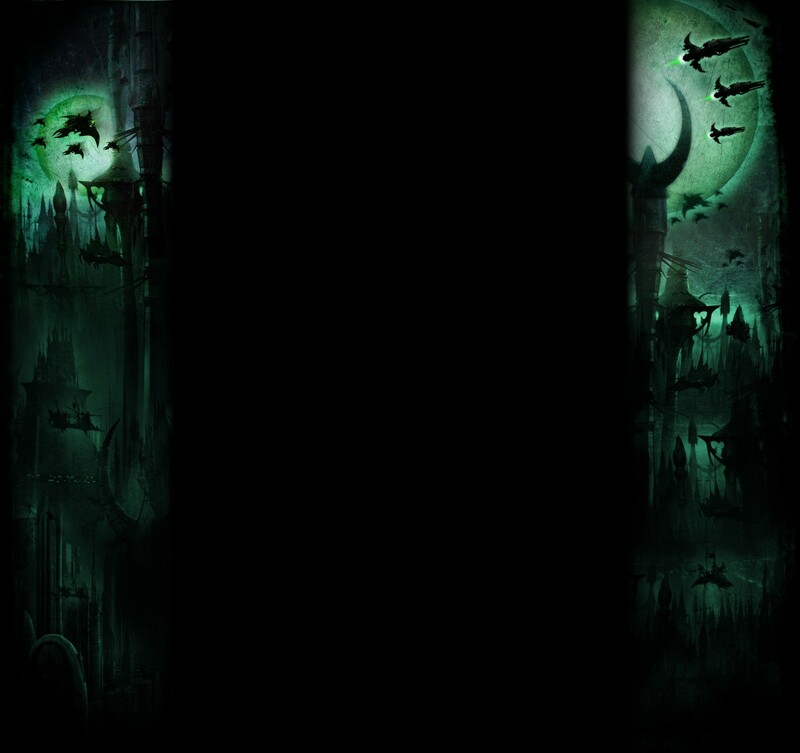 But those old Scourge wings don't look half bad, and it gave me an idea, though I don't have a way to test it first. I wonder if there are any Eldar Battlefleet Gothic ships that have sails the right size? If they fit, I think they'd look awesome. Does anyone have BFG stuff who could check, maybe upload some pics of the Eldar ships next to guardians? I wonder if there are any Eldar Battlefleet Gothic ships that have sails the right size? If they fit, I think they'd look awesome. Interesting idea I'm thinking of trying my hand with some Plasticard and attempting to make some corsair wings designed similar to the solar sails. After experimenting with various bits and pieces, I found a jetpack idea that I really like. 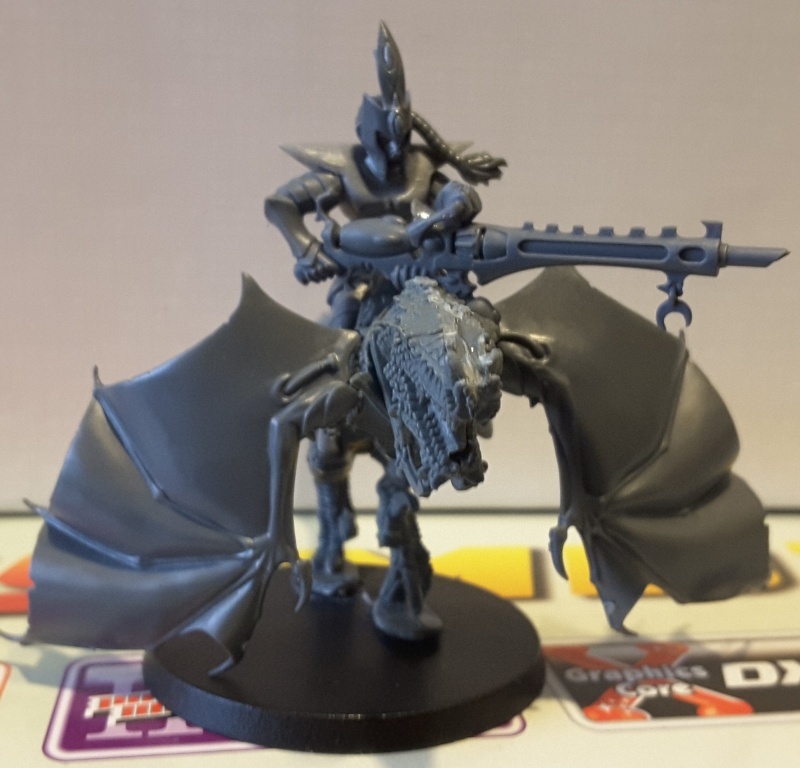 It turns out that the little pairs of blades/vanes that go on the underside of Raiders slot perfectly into the rear slots on Guardian torsos, and make for a jetpack that looks a bit more 'Eldar' to me than the Forgeworld ones. 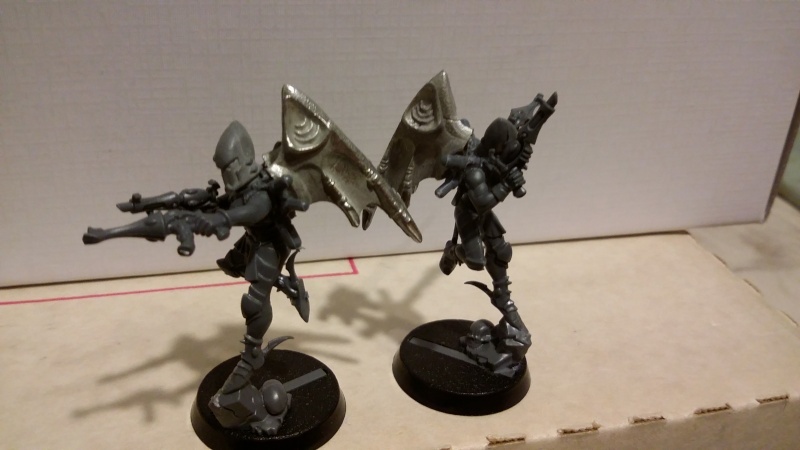 Also, for my Baroness and Prince I modified some blades from that Dark Elf Blood Cauldron/Khaine Statue thing for some more imposing jetpack vanes. I'm missing the *Jet* parts on those Jetpacks, without some kind of exhaust or something, to me, they look more like huge spikes or very tiny wings. Maybe You could add some of the retro thrusters (the small nozzle thingies) that also come with the Raider? Yeah i did think that, although i didn't want to load up the top of the models too much so they looked top-heavy. One of the other ideas was phantasm grenade launchers from hellions. Those would make half-decent looking thrusters. How did you make these guys, they look so amazing. Could I coppy something like that as beginner? Even If I can´t play them they look so incredibly cool, I wanna build them. So I'm liking these guys so far but I'm curious if they're too weird. If you can't tell, they'd be exodite malovelents with jet-packs. My thinking is that basically any exodites forced to join a corsair fleet would slowly lose themselves the longer they were away from their homeworld, until they're basically soul-less madmen. Also... they'd grow lumpy horned hunchbacks for some reason? I originally thought I'd flesh the horns out in to giant leaves or insect wings with green stuff, but I kind of like them as just horns. What are those tiny wings on the corsair jet-packs supposed to be doing anyway? 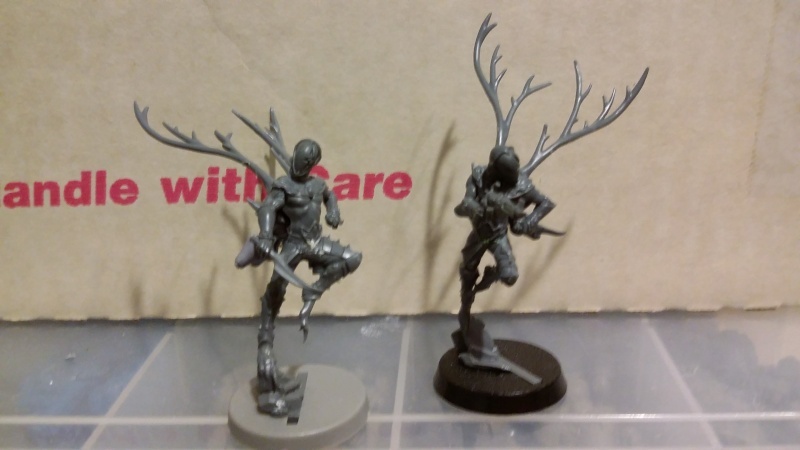 These guys' torsos and hunchbacks are covered in leaves if you can't tell from the pictures, so I still might go that route just to tie it together when I do my gap-filling. And ya that's a drilled out star cannon bit if you're curious. The jets are huge compared to the actual version, but then again it makes it more obvious what they are, and makes the wings even less necessary. Any thoughts or suggestions? I can make 6-7 more of these guys, just not sure people would get what I'm going for. Also bare-chested dudes with 4+ armor, I'm not sure. All of this looks really great. 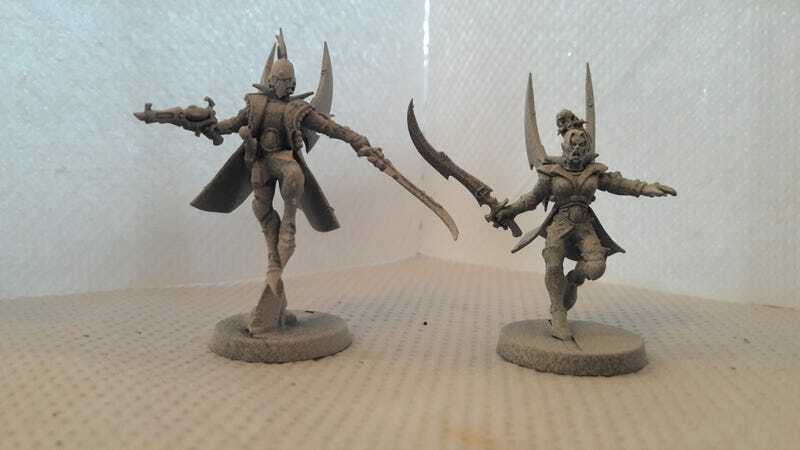 Subject: Re: Corsair Conversions or Alternate Models?